We are staying near Cape May, New Jersey for the next couple of days. The campground has lots of trees and a pool and jacuzzi. I've really missed using our jacuzzi. I hope Joan our neighbor has her new jacuzzi by now. I can't wait to try it out. The weather had once again turned hot as the east coast is having a heat wave. The temperature is in the 90's during the day and the 70's at night. We must run the air conditioner at night. That requires shore power or the generator to power it. Judy hates the sound of the air conditioner but is getting used to it. "The Anon Travelers" were going to stay at Walmart last night and run their generator for the air conditioner. We decided to stay in a campground and use the shore power not our generator. "The Anon Travelers" got rousted out at 10pm by the Walmart management as they were striping the parking lot last night. They ended up in our campground. I forgot to mention that Monica's poop hose problem is fixed, but it is not an ideal solution. The problem is the replacement hose is too stiff. We will be seeking another solution when we are not living in Monica full time. Judy had been doing all the driving except the backing up into the campsites. I am feeling much better, but I still have a low energy level. We are planning on selling Monica and getting a class C RV, but not for awhile. We want to still use Monica to go back and forth to San Diego and wherever our new home will be located. "The Anon Travelers" have a bet on when we were going to want a bigger rig. One of them, (we don't know whom), thinks we will trade in Monica before this trip is over. This new/used RV will be a bigger one, but on the same Sprinter chassis with an upgraded diesel engine. 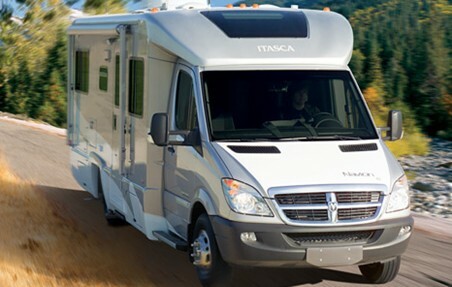 We are considering the Itasca Navion IQ 24 made by Winnebago. There is a picture of one below. We are visiting some major big cities on this trip so small is better for the immediate future. Anytime after we get back and settled would work. What do you think of what we chose? It reminds me of your Rialta. Yes, it does. Just many thousands more dollars. Is this model a B+ or C class?.